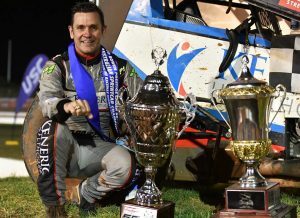 It was Boom, Boom for the Madsen Bros at Valvoline Raceway | Talking Speedway, Speedway news from around the world! 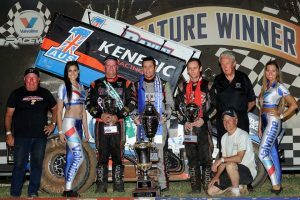 It was a case of double boom in the 55th running of the Australian Sprintcar Championship at Sydney’s Valvoline Raceway when Kerry Madsen successfully defended his Australian Championship and younger brother Ian raced his Watson’s Transport backed car into second ahead of Robbie Farr and Brooke Tatnell. Young Jordyn Brazier completed the top 5 and would go home well satisfied with his Championship performance. Madsen and McFadden were the two top points scorers and had the honor of starting on the from row of the 24 car field for the 40 Lap Championship decided. In the build up to the final race there was lots of activity on the twitter feeds from the Madsen fans boldly predicting a win for Kerry. Clearly they were on the money. By lap seven the defending Champion was already leading from younger brother Ian with McFadden sitting in third. By lap 22 McFadden’s chances had slowly diminished courtesy of a deflating left front tire that had been damaged during his earlier battle for the race lead and would force his retirement from the race. In front a huge crowd the Madsen brothers will go down in the Sprintcar history as the first brothers to run the quinella at the Australian Sprintcar Championship..Sadly as was the case last year the A1 might not be seen on Australian Speedways until Kerry Madsen returns home late 2017.With back to wins in the National Open and now the Aussie Title his confidence will be high as he plans for his return to the US and his debut in the Big Game Go Muddy back Team. Kerry will have his first race in the seat of the new Team car in Florida this February.